Most babies can learn to speak a language or languages without even trying — and so can older children, too, as I saw when I started to absorb, then speak, Finnish. But my success in learning Inuktitut later, as an adult, was less successful. Why? For one thing, I was never immersed totally in the language outside my Nunavut Arctic College courses. 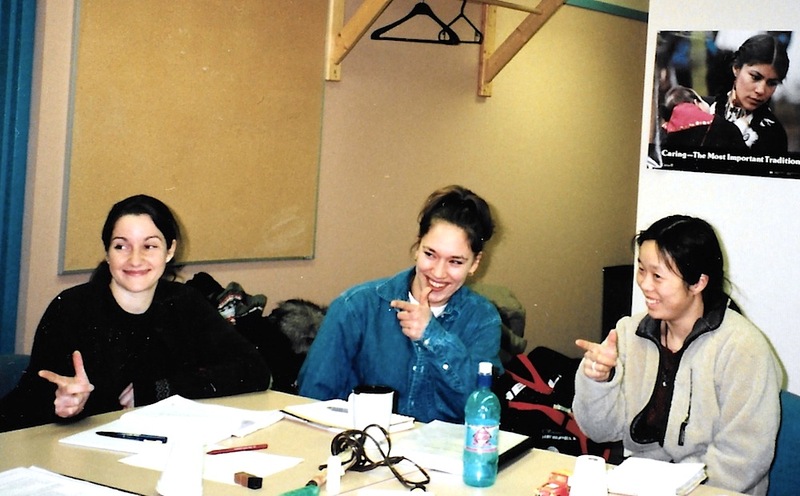 In Iqaluit there are many English- and French-speakers, and even when in more unilingual communities, there was always the presence of another language somewhere in the background — on television or the internet. Had I been able to visit an outpost camp and hear no English for a few months, I believe my mastery of Inuktitut could have quickly improved — but that was hard to do with job and family. On the other hand, although my mainly school-learned French was imperfect, I quickly became fluent when I worked in a unilingual French-language office as a young adult in Quebec. Perhaps if Nunavut or Nunavik had Inuktitut-only work environments, people would get better at speaking Inuktitut more quickly. And if all Inuktitut dialects in Canada used Roman orthography for writing, it might be easier to learn and use the language without mastering an entirely new alphabet. Even now, I can read and understand more of something written in Greenlandic or Inuinnaqtun than in syllabics, which require an additional level of effort to understand. • foster more publishing of books, magazines and other reading materials. None of these ideas are new. In fact, the above list reads like the to-do lists of many language specialists in Nunavut and Nunavik. But although these are commonsense, already-accepted ideas, many have gone nowhere in Canada’s North or moved too slowly to have an impact. Money isn’t the only issue, either: it’s will — if you just talk to your children in a language, they will learn. Look for future A date with Siku girl posts on Arctic talk, travel, thoughts and news.